bl.uk > Online Gallery Home	> Online exhibitions	> Asia, Pacific and Africa Collections	> Bombay, from Malabar Hill. 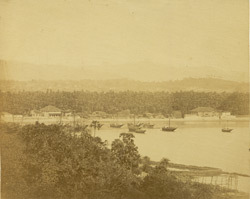 A photograph of a view of Bombay from Malabar Hill from the 'Vibart Collection of Views in South India' taken by an unknown photographer about 1855. Originally, Bombay was composed of seven islands separated by a marshy swamp. It’s deep natural harbour led the Portuguese settlers of the 16th Century to call it Bom Bahia (the Good Bay). The British Crown acquired the islands in 1661when Catherine of Braganza married Charles II, as part of her marriage dowry. It was then presented to the East India Company in 1668. The second governor, Gerald Aungier, developed Bombay into a trading port and centre for commerce and inducements were offered to skilled workers and traders to move here.